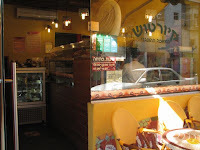 Address: 39 Bograshov st.; 178 Dizengoff st.; 18 Lincoln st.
Kurtos (in Hebrew it is pronounced as "kiortosh") is a chain of bakeries that sells the Kurtos Kalacs - an Hungarian traditional flavored rolled pastry. You can watch the employees roll the kalacs dough on a wooden stick and then flavoring it with chocolate, nougat, nuts and dulce de leche, before putting it in the oven to gild. This place is quite popular among Tel Avivians who tend to bring the Kurtos Kalacs when they're invited to dinners (as hosts we personally would like to get the nougat). You can eat it there but is usually ordered as take out. Bograshov branch is next to Tverya st.
* Tip: Best eaten when it's just out of the oven!